Click 'Advanced >>'. Uncheck 'Show paging header group'. Save the model and launch the application ( ). You can already create and update your shopping list. Note that since 'Product' is the primary key of the 'Items' table, once you create an item, you cannot change its 'Product' field (only update the item's quantity or delete it). 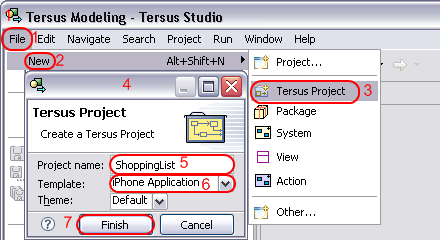 Select File (1)->New (2)->Tersus Project(3) to open the New Tersus Project (4) wizard. Enter a name of your choice (e.g. ShoppingList)(5) for your new project, select the iPhone Application (6) template and click Finish (7). The studio opens the new project's model for editing in the Model Editor (on the right), while a list of projects, which includes pre-installed sample projects, is displayed in the Repository Explorer (on the left of the screen). 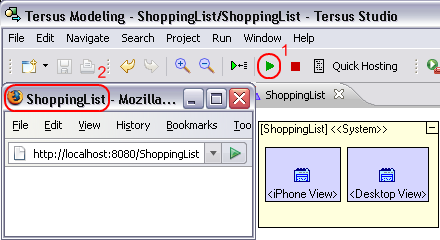 Click on the Launch the application (1) button in the studio's main toolbar to load your application in the embedded Tersus Server and open it in a web-browser (2). The application displays nothing yet, so let's model something to display. We shall now add our own modeling to the application, creating a basic shopping list application. Switch back to the Tersus Studio. 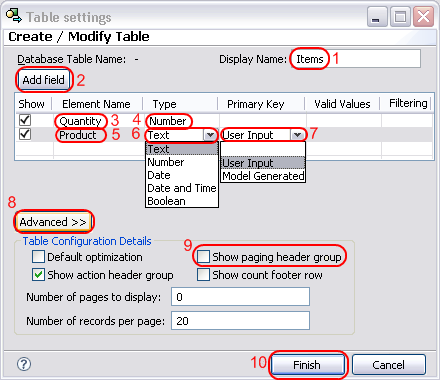 Click the Table Wizard(1) template in the Display category of the Palette, to select it. Note the change in the mouse pointer (2). 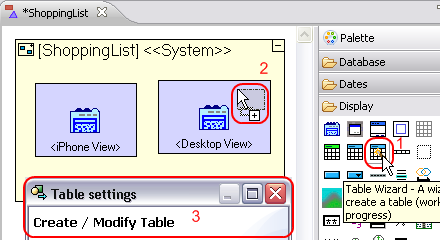 Click inside the <Desktop View> view model in the editor, to open the table wizard (3). Set the table's Display Name(1) to Items. Create a new field definition by clicking the Add Field(2) button. Set the field Element Name (3) to Quantity, and the Type (4) to Number. Create another field definition by clicking the Add Field(2) button again. Set the field Element Name (5) to Product, the Type (6) to Text, and set it as Primary Key(7) of type User Input. Note that since Product is the primary key of the Items table, once you create an item, you cannot change its Product field (only update the item's quantity or delete it). Click Advanced >> (8), and uncheck Show paging header group (9). Click Finish(10) to create the table. Click the New button(1) to add a product. 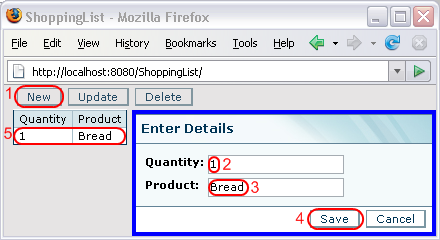 In the dialog, enter 1 as Quantity(2), Bread as Product(3), and click Finish(4). When the dialog closes, a new line will be added to the table containing the details you entered (5).